Scott Creek Farm is exclusively dedicated to breeding of the finest quality American Miniature Horse Association (AMHA) registered miniature horses for show, breeding or pleasure that will mature under 34 inches…THE SMALLEST HORSES IN THE WORLD. We double register our broodmares and stallions with American Miniature Horse Registry(AMHR) who recognize horses up to 38 inches tall. Our miniature horses have been carefully selected to exhibit a modern arabian horse look, exceptional refinement, conformational excellence, pedigree, and disposition for over 30 years. We believe these traits are critical to the positive future development of this breed. As consumate miniature horse breeders, we believe there is an obligation to produce miniature horses that will enhance and improve the quality of the breed, pass on desirable traits to future generations, and mature no more than 34 inches. We do not take this responsibility lightly. It is our mission to produce miniature horses with outstanding motion, presence, conformation, and athleticism that stay within 34 inches as adults. Thus with their concentrated genetics, our breeding animals continue to be an asset in the development of the miniature horse breed now and in the future. If you want the very best…….choose a Scott Creek horse. Scott Creek Farm is located near Salem, Oregon, approximately 45 miles south of Portland and about 3 miles east of Interstate Highway 5. The farm is a family operation that has been established in miniature horse breeding since 1981. 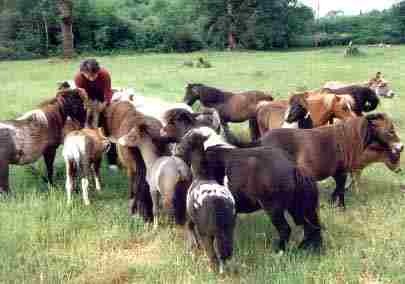 Since that time our farm has grown to maintain one of the larger breeding herds in the western United States producing exceptional quality AMHA miniature horses that have been sold all over the world. Horses and teaching have been Joanne’s passions since the age of nine. As a teenager she owned and managed a string of rental horses on the southern Oregon coast. During her college years, Joanne rode on the OSU equestian drill team and was fortunate enough to spend a year in Europe where she pursued her equestrian dreams by attending a British riding academy summer course. Back at home she bred and successfully showed quarter horses and paints for a number of years prior to her involvement with miniatures.She graduated from the University with a Masters in Education. She taught 1st through 8th grade classes for over 20 years while building Scott Creek Farm to the world wide reputation it now enjoys. As a young woman, Joanne also apprenticed as a farrier. Originally this was done to minimize the costs of maintaining her sizeable herd of horses. This developed into a significant opportunity to learn and evaluate leg conformation and way of going in horses. Since her involvement with miniature horses, the many years of studying horse conformation has been an invaluable tool in evaluating horses for both show and breeding prospects. She is frequently called on by others to provide an educated opinion for the potential purchase of a horse or if there are questions about movement and possible remedies. Joanne can frequently be found at shows assisting various competitors with last minute hoof trimming or providing advice related to gait of various horses. Since becoming associated with miniature horses, Joanne served her region by being elected to the AMHA Board of Directors on two different occasions and was elected to the post of AMHA Secretary and Director at Large on the AMHA Executive Committee. Joanne has been a pioneer in helping AMHA develop many successful programs. Such programs are the amateur levels, AOTE (Amateur Owner Trainer Exibitor), expanded the Futurity program to be both halter and performance, chaired the committee for rewriting the most recent standard of perfection. 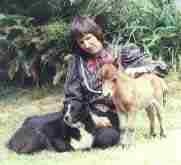 She volunteered her expertise in foaling, breeding and training of show horses to the Clubs of Europe, Canada and Australia. In the process of her travels, she has made many international friends and acquaintances. Joanne loves to share her passion and knowledge with everyone! Larry, on the other hand, had no prior experience with horses before marrying Joanne. With our first farm being located in a remote area, obtaining prompt veterinary assistance was almost an impossibility, particularly in an emergency situation. Consequently, at foaling time Larry's involvement was by necessity. Over the years and through numerous experiences, he has become recognized as a resource to others on the subject of health issues, breeding and foaling of miniature horses. He has been consulted numerous times by veterinarians as well as other breeders on these subjects due to the extensive and varied practical experience he has gained with his own herd. His experience covers the panorama from health issue, routine breeding and foaling techniques to complex birthing complications and stubborn breeding problems. His technical abilities led him to become the media manager of Scott Creek. Larry self taught became adept at designing and maintaining the website, producing our ads for the World Magazine, designing banners for our displays at shows and making our yearly outstanding sales videos often cited as the best in the breed. The video is available free upon request. We also post sections of the video on YouTube. You may subscribe to our Youtube videos under Scott Creek Farm to get notifications whenever we post a new video. We also have a Scott Creek Facebook page. Please take the time to LIKE us if you wish to receive updates on your stream. To demonstrate that the horses we are producing are an asset to the industry, it is imperative that the horses be competitively shown before numerous judges to obtain a valid conclusion as to the worthiness of a breeding program and the animals that are being produced. We show Scott Creek horses each year in the highly competitive Northwest show circuit. These shows routinely draw in the neighborhood of 200 horses per event from the entire west coast. Our successes in these shows have provided us with consistent qualifiers for the AMHA World Show every year. Our horses, as well as those purchased by our clients, routinely garner regional championships and high point awards in both halter and performance. The horses have been shown successfully by youth and amateur exhibitors as well as with highly competitive professional handlers. The most important forum for determining the worthiness of our breeding program is at the AMHA World Show. Here, we are honored to be showing with other horses from around the world who are among the best possible specimens. We are proud to say that the vast majority of Scott Creek horses shown at this level have brought home awards to their owners or to our farm. Since it is our intent to breed the all around miniature horse, our horses have won honors in both halter conformation and performance divisions at the World show. Since the advent of the AMHA World Show format, Scott Creek horses have continued with their winning ways collecting many World Championships and Top Ten awards in driving and performance classes. Some of the titles awarded to Scott Creek Horses over the last few years are as follows: 2 X National Best All-Around Champion, World Halter Futurity Champions, World Grand Champion Jr. Mare, World Reserve Grand Champion Jr. Mare, World Champion Amateur Junior Stallion, World Champion Youth Junior Mare, World Champion Under 28" Mare, World Champion Yearling Gelding, World Grand Champion Pleasure Driving Horse, World Champion Roadster Horse, World Champion Open Hunter, numerous World Top Ten awards in halter classes and a wide variety of World Championships and Top Ten awards in driving and other performance classes. World Futurity AOTE Grand Champion. We are also pleased to see that our horses have been highly successful when shown abroad by their owners, winning national champion titles in England, Europe, Australia and Canada. Our senior stallions, Brewers Orion Mystic (now retired)and Sierra Dawn Unos Monarch (HERD SIRES) have been listed multiple times on the AMHAs top ten money winning lifetime futurity sires. Our junior sires, both world champions, Scott Creek Monarch Commotion and Scott Creek Indi Go 500 continue this outstanding lineage. Scott Creek horses are truly recognized and awarded WORLDWIDE for their excellence and distinctive look. Sierra Dawn Unos Monarch recently won UK's HOYS SIRE OF THE YEAR and Scott Creek was awarded HOYS BREEDER OF THE YEAR. Australia's recent National Champion in both registries was a son of Scott Creek Monarch Commotion, Scott Creek Juste Commotion. As breeders, we feel obligated to continue to bring out new horses each year for evaluation by the judges. As we achieve success with our horses, they are retired to some other function such as breeding or pleasure and a new crop of show horses is brought out so that we can continue to measure our effectiveness at breeding exceptional horses that are an asset to the miniature horse industry. For more information about our miniature horse farm and horses try one of the options listed on the menu above.